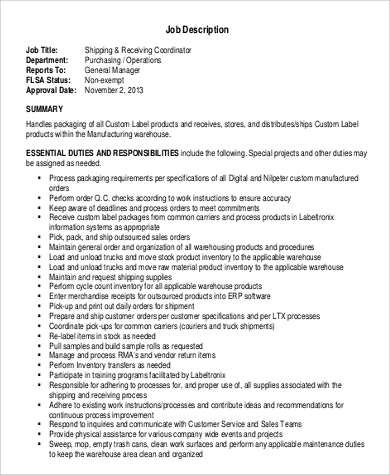 Businesses that receive and deliver goods by bulk require a shipping and receiving clerk. 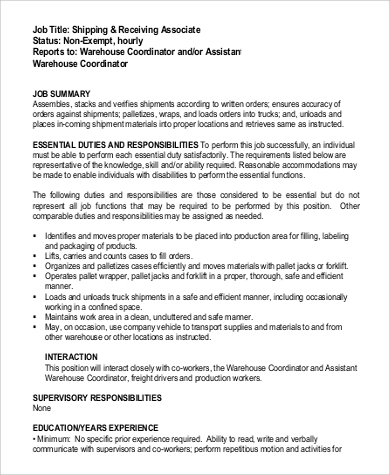 This personnel is encumbered with the laborious task of managing, handling, delivering, and receiving crates, boxes, and large units of goods. 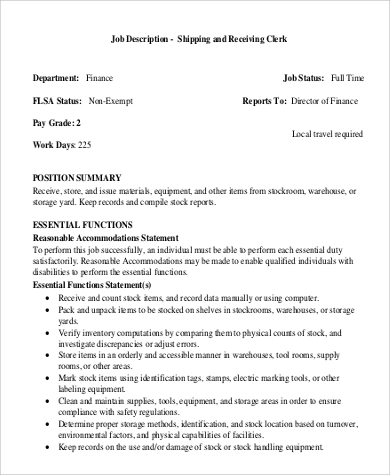 This job is not easy, it requires a combination of rigorous manual labor and sharp record-keeping skills. 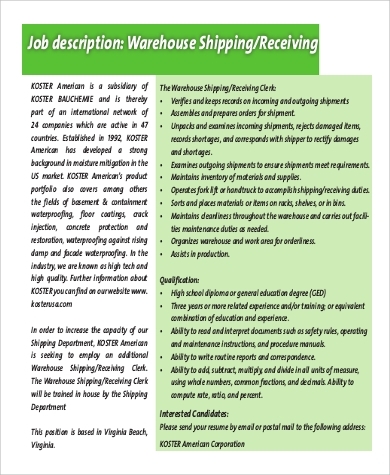 That is why, if you are a manager of a huge business operation, then you need to hire a shipping and receiving clerk who fits the job description. 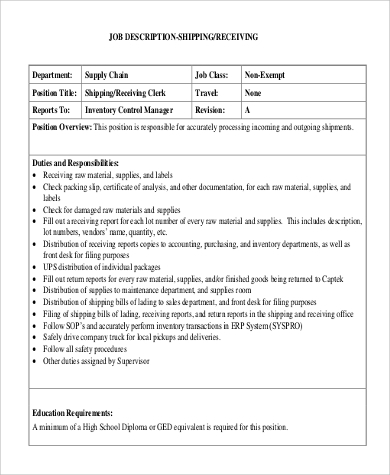 For your guidance, we are providing you with a huge collection of shipping and receiving clerk Job Description Samples that you may select from. These are ready for print. Simply scroll down below and click on the template that you deem suitable to your needs. Conducts physical inventories such as checking contents of shipped product against purchase orders for the purpose of verifying stock and identifying losses. Coordinates delivery of received items for the purpose of ensuring items ordered are delivered in a timely and accurate manner. Ensures the packaging, transporting, distributing, and the maintenance of the product. Knowledgeable of the laws pertaining to import/export. Adheres to all safety procedures regarding the transportation and storage of goods. Assists in receiving, storing, issuing, and delivery of equipment, tools, and supplies, and doing the required record-keeping. Responds to inquiries regarding accounts payable, inventory of goods, delivery receipts, etc., for the purpose of providing requested information and/or referring to appropriate resources. Physically capable of opening crates and other large containers using hand tools to unpack items received. Meticulously inspect shipments for damage and defects. 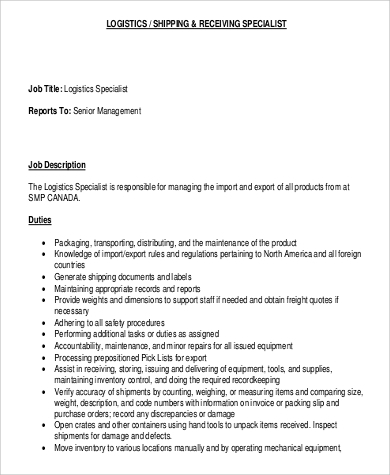 In the event that there are damages or defects in the shipped goods, he/she reports to the supervisor/manager or provide an appropriate solution for such damages. Verifies accuracy of shipments by counting, weighing, or measuring items and comparing size, weight, description, and other essential details stated on the invoice or packing slip and purchase orders. 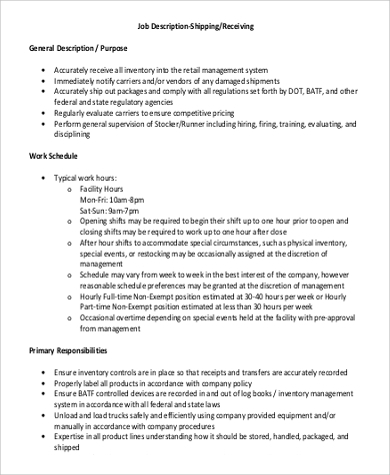 For more job description references, you may also check out our Property Manager Job Description Samples by clicking on the link. Traces lost shipments and/or customer claims of lost shipments. Keeps and prepares proof of delivery documents. 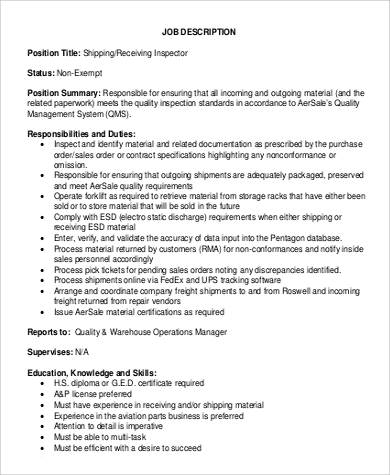 Reports directly to shipping and receiving manager if there are any. 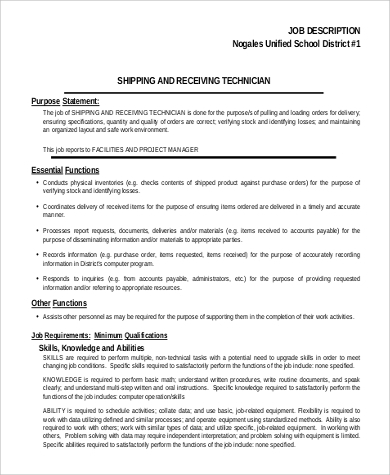 In terms of educational requirements, a high school diploma will suffice since this job does not entail academic-related functions. Ability to life heavy objects. Ability to understand and observe safety procedures. Ability to keep records and shipping documents in an organized filing system. Ability to maintain the quality of the shipped goods. Possesses basic knowledge in manipulating the equipment to be used in the shipping operations. Ability to perform simple arithmetic/numerical skills. 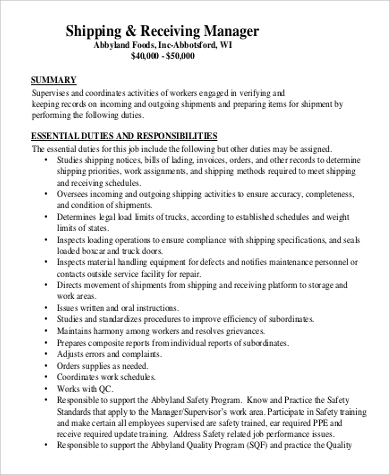 Knowledgeable of and capable of implementing the customary and standardized methods and procedures pertaining to the shipping of goods/products. Excellent physical health that enables him/her to withstand heavy manual labor on a daily basis, with the exception of weekends or rest days. Capable of procuring the necessary documents for shipping. Posses good interpersonal skills in dealing with suppliers, customer, and coworkers.